I have had many email enquiries about how I make my collagraph plates, especially when I mention tile cement or Polyfilla. Every collagraph artist works in their own particular way, which I think is the exciting thing about this process. So here are my tips and wrinkles. If you are ever Gloucestershire way, I run weekend courses showing exactly how I work and pass on my secrets. 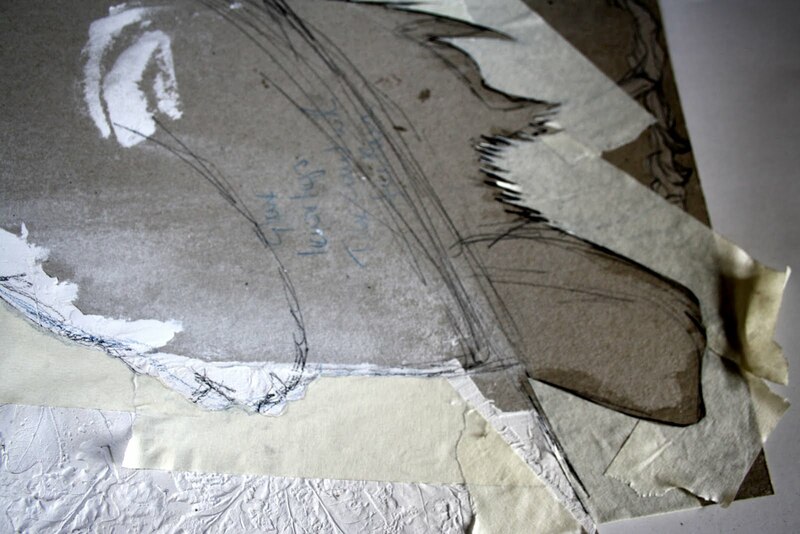 I am working on a commission at present, the drawings of which I have posted previously. I like to use grey board and as you can see I have reversed and cut out the shape of my raven and also started the background of oak leaves. 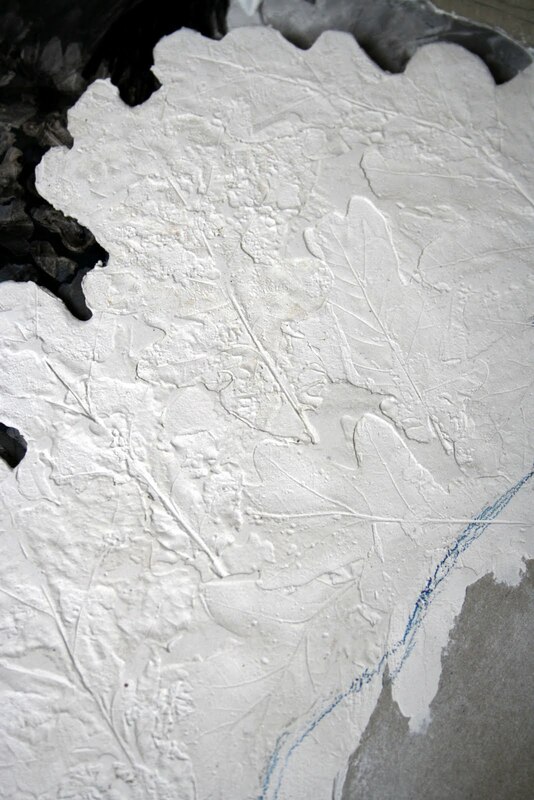 Mixing Polyfilla with PVA glue I have applied it to the substrate and while still wet pushed in pressed oak leaves. This gives a very delicate impression that will print fantastically. Remember less is more! With the background dry I mask the edge of the raven with masking tape. Apply another layer of Polyfilla(who are not sponsoring this post) and push feathers here and there again to give a hint of feather to the finished composition. Feathers work really well, this photo looks as if the feathers are still there. This plate is far from finished, Polyfilla and tile cement hold far too much ink and will print too dark if it is not sealed with PVA glue. 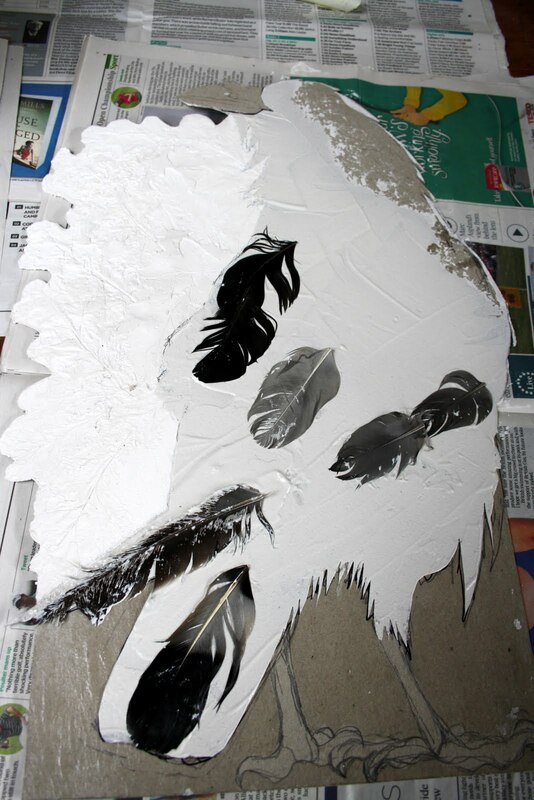 I also want to use carborundum to make a really black bird. So off to your nearest DIY store and see what fillers and tile adhesives they have on the shelves and experiment. i loved this post. thank you. gosh, wish i lived nearby as i would love to take your class. Great post, I'm off to give it a go... Wish me luck.... I might just get the job of tiling the bathroom..
Not only are you a talented artist you are a natural teacher Sue. Loved this mini lesson. I am hoping to come to one of your weekend courses! Utterly fantastic, how do you then print? Do you use a press, or does that damage the textures...I am asking as this is the sort of printing that is possible for Primary school children to do, but have not got the resources for a press, I do however have an old flower press (approx 30cm square) which could be used with children. I too wish I lived near, had a time loop to give me more time (to do all the things I have learned to do). I have heard too of people using car body repair paste. 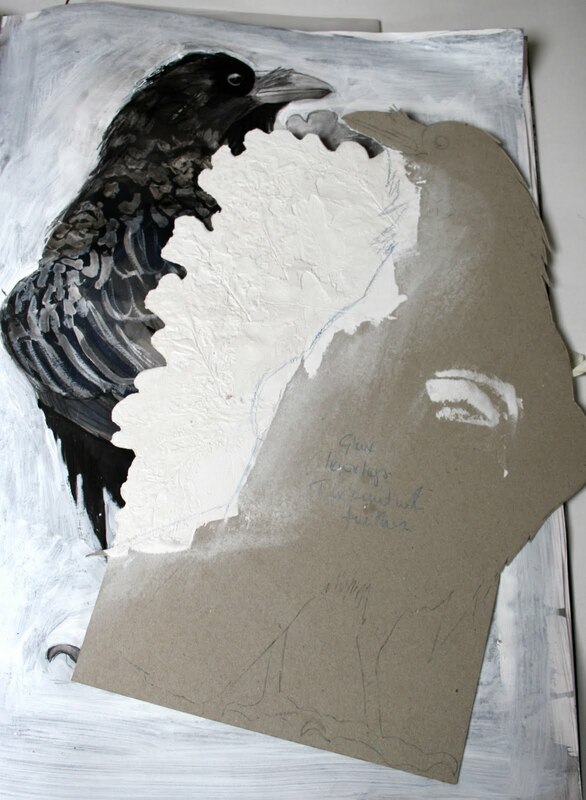 I have also used acrylic gesso, which gives a nice rich texture. Sorry Charlotte, collagraph is an intaglio process so you need an etching press to print them successfully. And yes Ian, Polyfilla and tile cement is only the beginning, gesso, acyrlic mediums, anything that spreads on can be used to make plates. Sue, for us in the U.S. what is the 'real' use of Polyfilla? Is it wall plaster? Thanx! Thank you so much for sharing your process. I will definitely give it a try. If ever you come to Australia will you do a class? I know a few printmakers who would love to learn that technique. Well Jill I don't think I ever use Polyfilla for it's real use. It is a trade name for the stuff you use to fill cracks, but tile adhesive and grout work well as will car body repair paste as Ian suggested. Lets face it everyone, if it spreads and drys hard and does not flake off use it. Excellent post Sue - now.... if only I had an etching press handy! I will sign up when I'm back in UK next - more secrets needed! How wonderful to see how it's done and the progression... can't wait to see the finished piece. Thanks Sue, I rather thought that might be the case, however I have an idea for printing that may work with my year sixes. Working along similar lines with textures but as relief not intaglio. That is unless I can persuade school to buy me a press...sigh!